Off-the-job training is learning which is undertaken outside of the normal day-to-day working duties but is within working hours and leads towards the achievement of an apprenticeship. Off-the-job training is at least 20% of the apprentice’s contracted hours, over the total duration of the apprentice’s planned training period (this excludes holidays). It can be delivered flexibly, for example, as a part of each day, one day per week, one week out of five or as block release. Off-the-job hours need to be evidenced over the duration of the Apprenticeship programme, not per week, per month. For example, 10% one week/month and 30% the next week/month meets requirements. Off-the job training can be delivered in the apprentice’s normal workplace or at an external location. Apprentices must gain new knowledge, skills and behaviours relevant to their apprenticeship. Progress reviews and on programme assessments do not count towards 20% off-the-job training, as they do not deliver new knowledge, skills and behaviours. Off-the-job training must be away from the apprentice’s normal working duties. The training should not take place outside the apprentice’s paid working hours. Apprentices may choose to spend additional time training outside paid hours, but this must not be required to complete the apprenticeship. If needed, English and maths training must be on top of the 20% off-the-job training requirement. 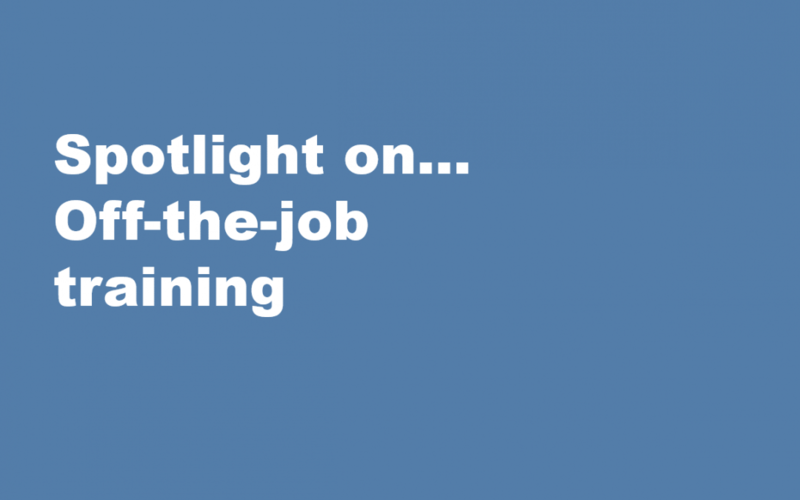 How can I tell what is off-the-job training? If you answer YES to these questions, it is off-the-job training. Is the activity directly relevant to the apprenticeship standard or framework? Is the activity teaching new knowledge, skills and behaviours? the learning taking place within the apprentice’s normal (contracted) working hours? But, day-to-day, what does this look like? A myth-busting document to counter five common myths.